I have to be the most unorganised person ever just take at look at my blogging schedule. I'm the kind of person who would rather stay in bed for an extra ten minutes than look presentable ( yes us bloggers do go outside without make up! ) If I really need to make my self presentable I have to come up with a simple make up routine that results in me looking socially acceptable and don't look like I have just rolled out of the bed which I more than likely have done. A simple but effective way to do great make up in a matter of minutes is what I like to call "no fuss eyeshadows" if you don't know what I mean I will give you a simple definition. An eyeshadow that can be applied in a simple sweep with little or no blending involved. Sounds good right? 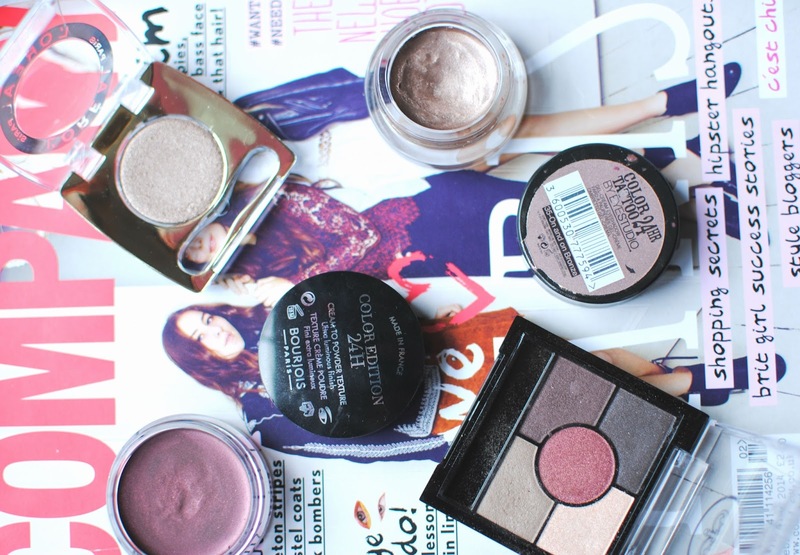 But this method only works with some eyeshadows ( lets just say some where only made for the crease of your eye) I have chosen some of my favourites that help my quick fix make up and unorganised life. First up is the cream products which are the Queens of no fuss eyeshadows, it is that easy to apply you don't even need a brush! My two favourites are Maybelline's Color Tattoo in " On and On Bronze" and Bourjois Color edition cream eyeshadow both very easy to apply and wear with absolute no fuss required. Next on the list is the powdered eye shadows that tend to be stereotyped and everyone things you need a whole palette of shades and textures to create perfect eye make up with powered eyeshadow but believe me that is not the case. My first pick is the L'Oreal eyeshadow in brown lame which I bought as an accident ( I thought it was their loose pigments but later discovered I was wrong) I was initially disappointed that I had bought it and didn't need it but seeing as I want to try more L'Oreal products I thought I should give it a whirl. Its super pigmented and applied with a fluffy brush things really can't go wrong. Another powered eyeshadow pick is the Rimmel London palette in Brixton brown , some shades are great on their own or together to create a more complex eye make up but still keeping it simple and easy. Seeing as there are so many products on the market that can help us achieve no fuss make up I think I will take you up on the offer and stay in bed for that extra ten minutes! Well wouldn't you? What is you're no fuss Products ? Great post. I go for lining with Rimmel Scandaleyes in the shimmery brown colour, Bourjois Colour Edition in the lightest gold shade/ then topped with an MUA shadow (pearl) in the crease and a quick coat of Natural Collection mascara. I love Bourjois quad shadows for a more complex look, though nothing beats my Naked palette! I love the bourjois cream eyeshadow! I really want to try that Rimmel palette, all the shades in it look beautiful. Like you I use the Maybelline Colour 24 tatoo in on and on bronze, so easy to put on without having to properly blend and the colour even as a base is great. That loreal eyeshadow looks stunning! Personally, for a no fuss smoky eye I like the NARS duo in Charade. You need only the two colors for a smoked out look with a twist (they are a bit on the mauvy/plumy side). No fuss makeup is most definitely my favourite kind of makeup 6 out of 7 days a week. Afterall who doesn't like to go all out for a night out? I know I'm guilty of spending up to 3 hours doing hair and makeup, haha. All part of the fun. The Color Tattoo's are gorgeous! I have the champaign colour called Barely Branded and it's perfect by its self, with a single sweep of powder eyeshadow or as part of an elaborate look. I'm definitely planning on getting more! Lovely post :) Any other saving time tips? I love Maybelline Colour Tattoo, just one swipe and my eye shadow is done. Perfect for when I am in a rush.